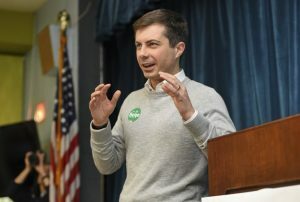 Buttigieg, an Episcopalian, drew scrutiny for comments in a USA Today interview published Wednesday in which he said Trump’s behavior is at odds with his understanding of the teachings of Christianity. During an appearance on ABC’s “Good Morning America” on Thursday, Buttigieg was pressed by host George Stephanopoulos on whether his comments were consistent with a need for “decency” in politics for which Buttigieg advocates in a recently released book. “I work very hard to make sure when we oppose this president we’re not emulating him, but we do need to call out hypocrisy when we see it,” he said. Buttigieg, a military veteran of the Afghanistan war, went on to criticize “people wrapping themselves in the flag who evidently faked a disability to get out of serving” in the military. That was a reference to the controversy over whether Trump received a legitimate diagnosis of bone spurs in his heels that led to his medical exemption from the military in 1968 during the Vietnam War.